If a spectral cube is loaded, we may visualize RGB preview image from specific hand selected bands. When pressing the Preview button, the spectral plot will show R,G, and B band lines. 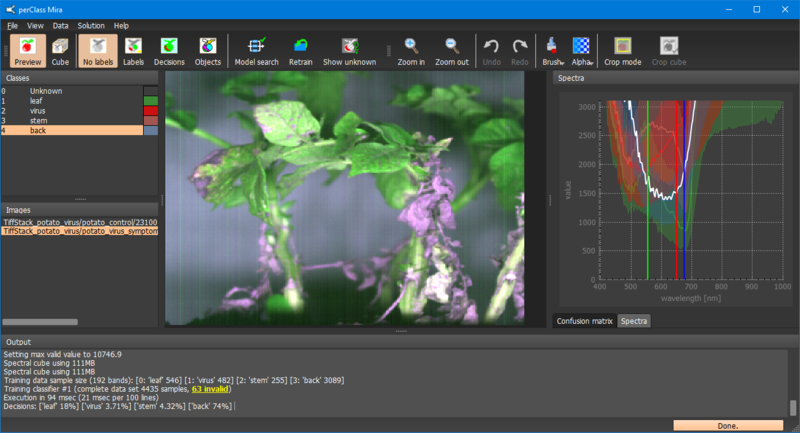 RGB preview is especially useful with natural objects and remote sensing scenes where certain types of materials may be visually distinguished simplifying the labeling process. For example, th eiage below shows a potato plant with some leaves infected with a virus (courtesy WUR University). Note that the virus-infected leaves exhibit distinct color in RGB preview. We would not be able to distinguish them on any single band image of the same cube without prior knowledge or without considering specfici macroscopic folding of the leaves. Copyright © 2018-2019 by perClass BV. All Rights Reserved.